mount forest | J.J. McLellan & Son "
From space-saving designs to the latest in sophisticated style, our design tips are made with you and your dream kitchen in mind. While you may envision your ideal kitchen with granite countertops and top of the line appliances, many homeowners don’t have the budget to afford these dream spaces. However, that doesn’t mean that you can’t update your space to make it more enjoyable and more uniquely yours. * Countertops — To simulate the look of real (and very expensive) stone, without the cost, use ceramic tile or a higher density, more upscale tile called through-body porcelain tile. Especially for countertops, since they cover a large surface area of your kitchen, a new tile surface will add a dramatic update. However, for an even lower cost, choose a new laminate countertop to replace outdated or worn countertops for a fresh, new look. * Faucets and Hardware — Replacing an old faucet with a newer, stylish model in an updated finish will instantly perk up a kitchen. Then, update drawer pulls and knobs to match the finish of the faucet to pull your room together. * Cabinets — If your cabinets are paintable, a fresh coat of paint can brighten and refresh worn cabinets and give the entire room an updated look. * Window coverings — Remove old valances and let in more natural light with simple, open window treatments. Replace old vinyl blinds with two-inch faux wood blinds. These offer an upscale look of genuine white wood blinds without the associated cost. * Paint — Perhaps your room has some flowered wallpaper or grandma’s favorite shade of pink on the walls. Painting is often the least intimidating project and has the biggest impact on a room. So strip off that wallpaper, prime those walls and add a splash of your favorite color to reflect your style and update your kitchen. * Vanity and Countertops — Since it is the working area of the bathroom and often the focal point, you may want to replace the current vanity. Or, if the vanity is in decent shape, try working with what you have and just replace the countertop and update the knobs and pulls on the vanity. Since you don’t have as much area to replace as in the kitchen you may want to try an upgraded material for the countertop, such as a ceramic tile. * Faucet — Often the focal point of a bathroom is the sink and faucet area. For a modest price with large impact, you may choose a more bold or dynamic new faucet. Faucets today are available in a variety of shapes, designs and finishes to meet the style and functional needs of any bathroom. * Paint and Color — Inject color and style into a bathroom with a new paint color. Since it is a smaller space, especially for a powder room, choose a color that you love but might not be brave enough to use in a larger, more prominent room. Be sure to tie your color together with coordinating towels and shower curtain. * Floor — Since the bathroom is one of the most used and abused rooms in the home, try updating the flooring with a ceramic tile or through-body porcelain tile to add style and functionality to your bath. With a little more room in the budget, you now have the opportunity to do a bit more or to upgrade the materials to transform your room. Just, don’t forget the basics, such as painting walls and changing window coverings. * Countertops — With a bit more budget, you may now be able to afford upgraded countertop materials, such as stone or a solid surface product, such as Silestone®. The natural-looking surface will update and add style to any kitchen. * Floors — New laminate flooring may be a cost-effective choice for homeowners who prefer to leave installation to the professionals. However for the adventurous DIYer, natural stone products, such as slate, are now an affordable and stylish option. * Sinks, Faucets and Hardware — Since the sink and faucet are functional parts of your kitchen that you and your family will interact with everyday, they are great updates to consider. Beyond just replacing with newer models, perhaps you may want to upgrade to an undermount sink or a high arc faucet with pull-down spout. When choosing the new faucet you can let your design flair loose and choose a new finish beyond the traditional stainless. Just be sure to coordinate the drawer pulls and knobs in a similar finish. * Flooring — While ceramic tile is a popular, cost-effective option, a more upscale and luxurious choice for flooring is a natural stone, such as granite. Today’s natural stone floors offer a variety of colors and patterns to add a unique and upscale flair to your bathroom. * Vanity and Sink — With more budget to work with, replacing the current area with a pedestal sink or a new vanity will automatically add an updated, new look to the bathroom. Pedestal sinks often make the room look larger and more upscale than a vanity, but if storage is a concern a new vanity is the wiser, more functional choice. * Water closet — While you may not think of a toilet adding style to a room, a shiny new toilet (perhaps to match a new sink) will give your bathroom a fresh new feeling for you and your guests to enjoy. * Faucet and accessories — With the endless variety of coordinating bathroom collections, a new faucet and accessories will update the look of your bathroom, tie your design together for a cohesive look, as well as provide functional storage tools, such as shelving, toothbrush and soap holders and towel bars. A big budget opens the door for many other upscale materials or custom design details. Again, even with a bigger budget, don’t forget those easy and inexpensive fixes, such as painting! * Countertops — Larger budgets could mean larger natural stones, such as marble or large pieces of granite. These beautiful, large slabs of stone can add a naturally beautiful design that you can use as the central inspiration for the rest of the room. Additionally, new popular solid surface countertops, such as Corian® may be an upgrade option. * Floors — Wood floors add to the natural beauty and design of a kitchen. Newer woods, such as teak, are becoming more popular for their natural moisture resistance and beautiful color tone. * Lighting — With the extra budget, be sure to banish the fluorescent lighting fixtures to the garage. Many homeowners don’t realize that different types of lighting actually produce different colors of light. For instance, fluorescent produces an unflattering, cold, bluish light. To add a warmer, natural-looking light, try recessed lighting fixtures or sconces with incandescent or halogen lights. * Sinks, Faucets and Hardware — When updating the countertops to new natural stone, an undermount sink is the perfect way to accent the new smooth-edge design. Additionally, with the variety of designs, kitchen faucets can add the final touch. With intricate designs with one or two handles, high arc or even pullout spouts, the faucet can be the jewel in the center of the new beautiful countertop. And if the budget is too low to overhaul the cabinets, be sure to update the old cabinets with new hardware to coordinate with the new sink and faucet. * Cabinets — Today’s options in cabinet colors and styles are endless. No matter what your style preference or budget, there is a cabinet to meet your needs. For tighter budgets, you may look to affordable stock lines of cabinets. Or with larger budget, perhaps semi-custom cabinets with custom storage solutions and accessories are in order. Also, remember the newest mix and match trend when choosing your cabinets. This can add more to your design and may help to accommodate your space or your budget. * Vanity — No longer do you need to choose from what’s in stock-with a larger budget, you can begin to design more customized vanities. Whether you are interested in a more traditional look that meets your needs, or a completely original look with exotic materials such as natural stone, the designs can be as big as your imagination. * Sink — To go along with a custom-designed vanity, you might consider a specialty sink. Whether you are interested in a free-standing vessel sink with a wall-mount faucet, or a uniquely shaped stainless or porcelain sink with a unique asian-themed free-flowing faucet, this area can become a beautiful art masterpiece. * Shower and Bath — Showers and baths can become the spa-like experience of your dreams. Think about creating a vertical spa with massaging jets in a walk-in shower made of stone or glass. Or add a sunken tub with a large Roman tub faucet to sink back and relax after a long day. No matter what your budget, any homeowner can add design style to their kitchen and bath(s). You may need to start small or wait until your budget allows, but by adding elements that inspire you, you will be able to enjoy these two well-used rooms. Click HERE to go to Moen’s website and see more tips! Then drop us an EMAIL or give us a call at 519-323-2000 or 1-866-565-5513 to plan your next plumbing renovation! Looking to build a new house, do renovations or even minor repairs. 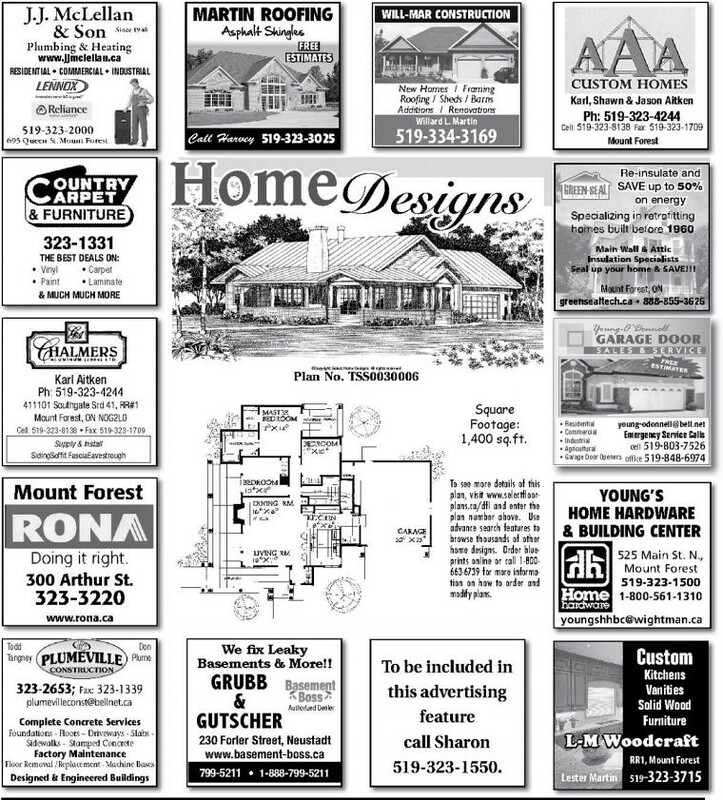 Along with us at JJ McLellan & Son check out all of these contractors in our area in this Home Plan Feature which is a feature in the Mount Forest Confederate. We can help with anything from a leaky tap to new home construction plumbing or a furnace service to a complete heating and air system (furnace, air conditioner, HRV). 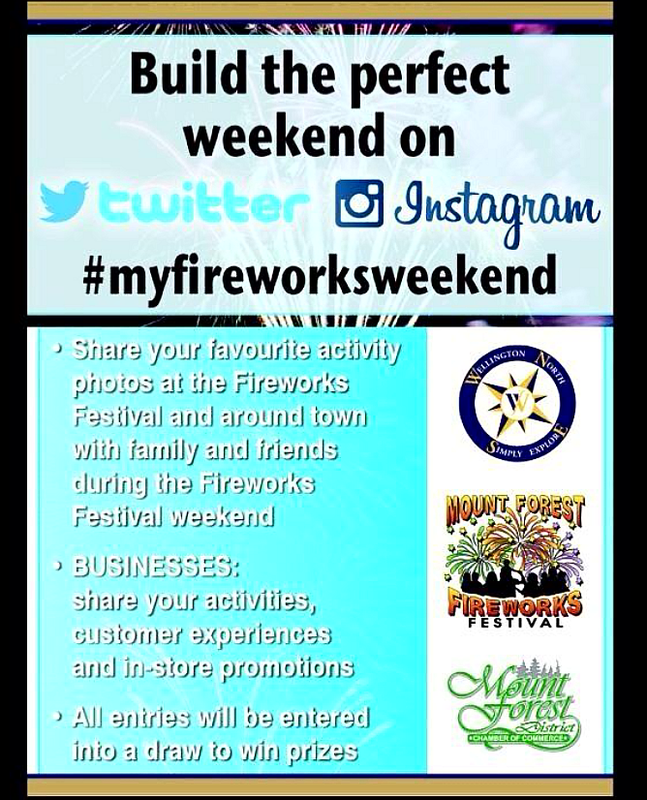 Looking to move to our area check out the town website for Mount Forest as well as our community guide http://www.wnguide.ca/ for Wellington North! Contact us to ask about our Water Heater Program . 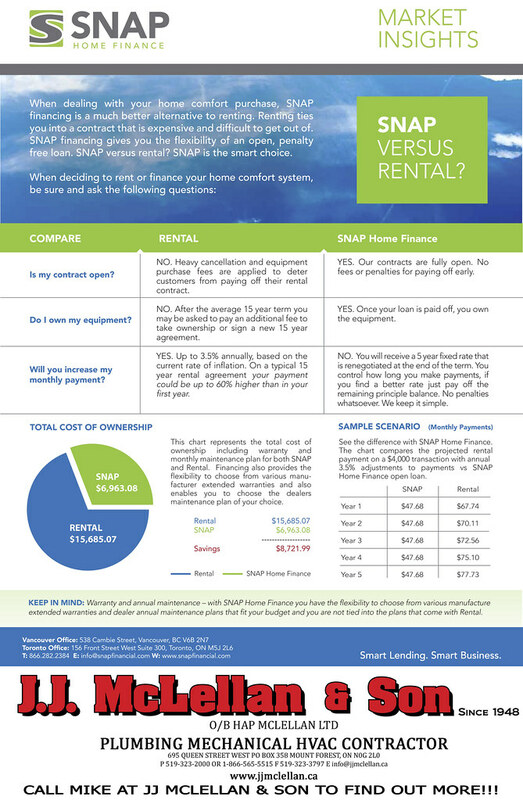 To obtain a natural gas water heater, there are two options available which include renting or buying. 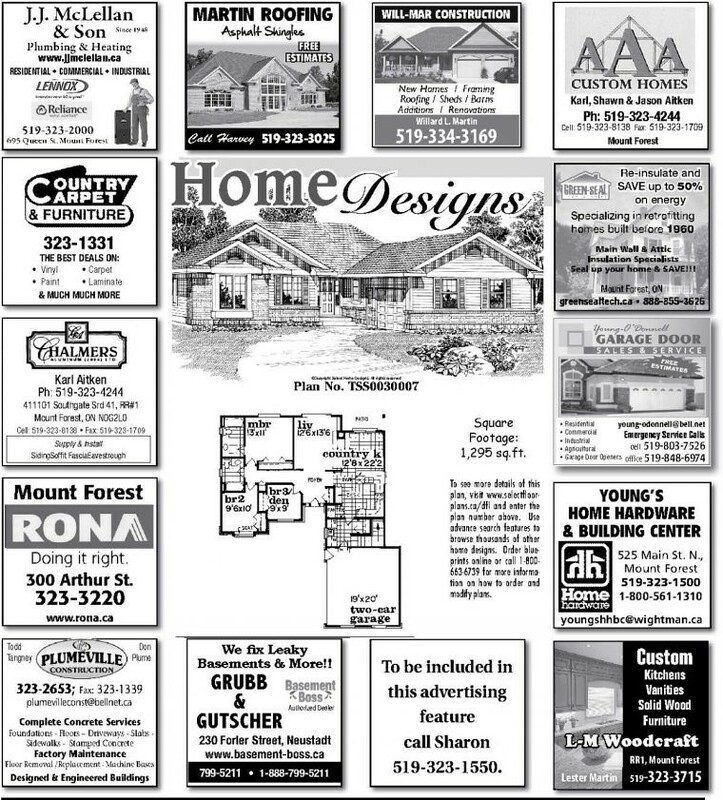 If you know where you would like to rent or buy, please click on one of the retailers below. If you would like assistance in finding a reputable contractor in your area to help you make the decision, please click on the HRAI logo below. We are members of the HRAI you can do a search for a local contractor by clicking on the logo image above and searching their Contractor Locator click For My Home, Appliance Info and be sure you enter your postal code, it searches based on your postal code for your area matching you with the closest Plumbing & Heating Contractor. Give us a call or email to ask us about our Water Heater Program! Join us for an Information & Demonstration of the Singular Green (by Norweco) Complete Onsite Wastewater Treatment Package A great “green” alternative for your Septic System! At our shop located at 695 Queen Street West in Mount Forest On Thursday May 12, 2011 from 4-8pm. The Singular Green treatmetn unit is certified to NSF Standard 40 & the Bio-Kinetic Sstem is certifieid to NSF Standard 46. These listings provide you the highest safety, reliability and quality. Contained in a rugged, heavy duty, UV protected polyethylene tank, the Singular Green treatment system weighs less than 900 pounds and can easily be installed with a backhoe. 48-hour retention in the Singulair Green system reduces tank pumping frequency as compared to other systems that have smaller capacity. System operating costs are low. The only electrical component is our low RPM Singulair areator. Durable, reliable componets are safely installed out of sight, below grade. No exposed power cords, compressors, equipment or air lines that are above ground and accessible to children or pets. The patent-pending internal and external ribbed design assures long term tank integrity and minimizes the potential for tank damage due to careless pumping or hydraulic forces. The robust tank design and integrally molded internal walls allow Singular Green to be installed up to three feet below grade. Injection molded risers and lids, with tamper resistant fasteners, provide security, strength and safety. 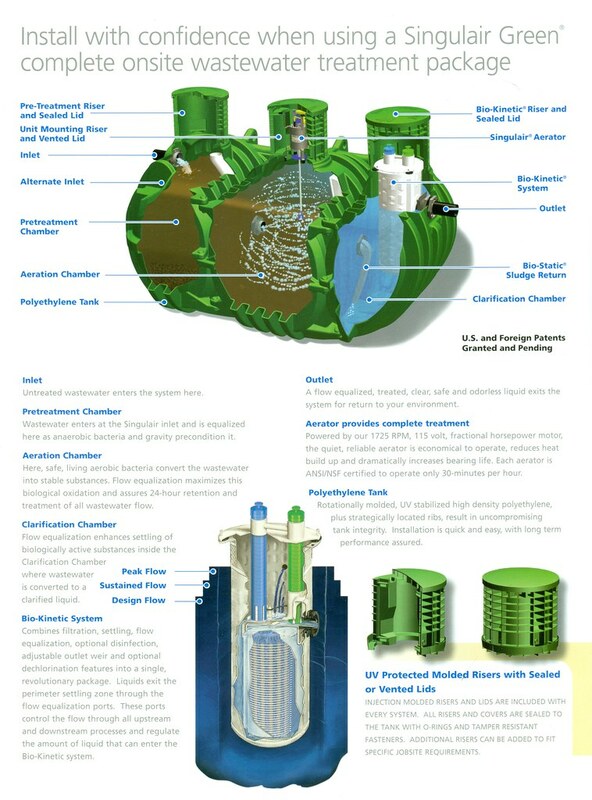 Single tank convenience; the Singular Green contains pretreatment, aeration, clarification, filtration, flow equalization, optional disinfection and dechlorination all in one compact treatment unit. The need for addtional treatment system tankage is eliminated. The inherently strong ribbed-arch shape of the Singular Green tank allos the use of most native soils for backfill and minimizes the need for water during the installation process. The Singular Green system automatically equalizes influent and effluent flow through all stages of the treatment process. Even during periods of extreme hydraulic or organic overload, effluent quality is maintained. Variations in flow do not affect treatment performance or system operation. Your local, factory-trained, certified and licensed Singular Green dealer sells, installs and services every wastewater treatment system with pride! As a Norweco distributor we are fully trained to install your Singular Green system and any other Norweco product you may choose to protect your environment! Our company has completed the Norweco nationally accredited Singular Green factory-training program and we have 5 fully trained technicians for the install and service of your Singular Green system! 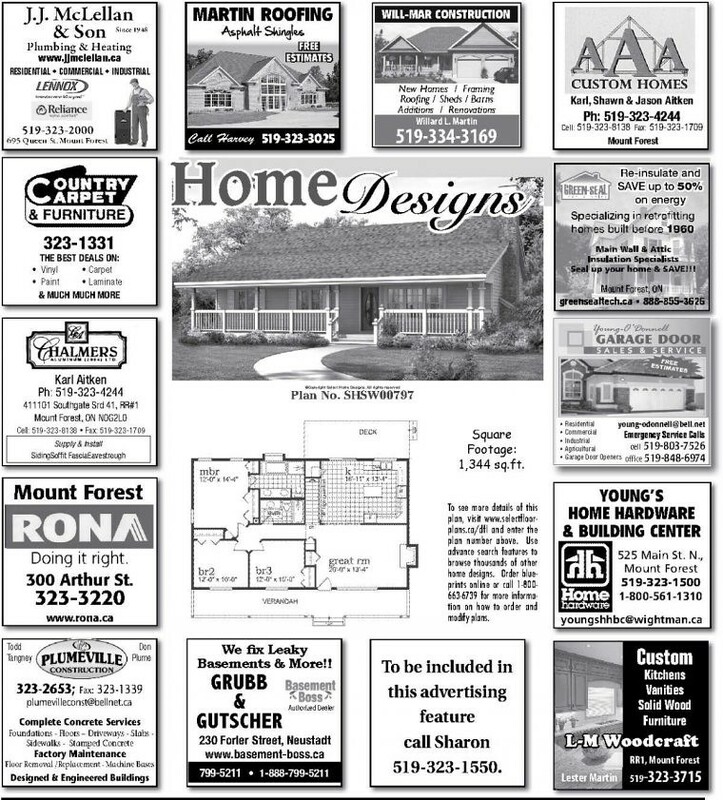 Check out this weeks Feature Home Plan in the Mount Forest Confederate! Whether you are building a new home or require plumbing or heating service for your current home give us a call ! We are the Home Comfort People who Service what we Sell ! Make sure your name stands out on your resume – make it larger than your address and bold it. What job are you applying for… if you find a job posted for a company be specific and say you are applying for that specific job. Use this as your objective. If you are applying and there isn’t a posting specifically put what your objective is and position you are trained for. If a company is looking for a licensed gas technician… and you do not have a licence… does it make sense to apply? No. If you have taken a co-op class which relates to the job – this is experience – use this on your resume. If you can get a reference letter or marks from your co-op placement even better. Any other direct experience which can relate or is transferable to the job – this is key! The trades are all about hands on just as much as it is about learning the book work in school. Training – if you have completed any type of training this is very important! Be sure to list it on your resume – however also be prepared to show proof if asked. Before an interview – even before you apply do your research about the company. Do not get into an interview and then ask what we do. Speak confidently and ask questions. Networking is very important – a lot of time, although ‘what you know’ is very important for any job, its also ‘who you know’ that is almost equally or even more important in the job search. By networking you make connections and people talk, when people talk you can almost receive more credit/reliability/respect by obtaining a job this way. Social Networking – this is becoming huge not just for inviduals but also for businesses. One tip by Bill Nelson this morning was related to Facebook and the content posted on Facebook. Beware what you post – it will be there forever and potential employers can search online and could potentially find this information. Education is very important and essential to get any kind of job. If you are unsure what you want to do as a career, however you are going forward with post-secondary education – choose a path with transferable skills. As a personal example, I took a year off after high school and worked full time at my part time job (maternity leave position at a local car dealership as the service advisor) this provided me with great on the job experience and also helped me to realize that I should to go school for Business. I then applied for General Business at Conestoga College and was accepted, it was a two year course which I thought was perfect, get in, get out! Half way through my 2nd year I seriously debated transferring over to the Business Administration Management Studies program. One thing I will always remember my parents telling me and making very clear is that if we ever wanted to work within our family business we had to go to school – this I am so very grateful for! I switched the program and spent another year in school after which I joined our family business, as a part of the 4th generation. On the job experience is important, however formal education is just as, if not more important. Receiving a diploma, degree, certificate or trade license is incredibly valuable, something that does not cost to carry around with you and once you receive it no one can ever take it away from you, these exact points I remember being reminded of from my own family… its true! At the end of the workshop the mentors were asked to provide one piece of advice to the students. My piece of advice to the students was… Think of what you enjoy doing, whether it is your hobbies, a part time job, sports etc. Think of the skills you use to do those. Such as for me I enjoy working with numbers, writing, working with people and being creative/artistic. All of which relate to my career! It was a pleasure speaking with the students and applaude the Career Education Council as well as the High Schools for doing workshops like this for the students. I am sure the information learned will prove to be quite valuable in the future !